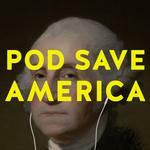 Pod Save America: "Card-carrying badass"
I thought it might be fun to talk about the topics in the show and also the show itself? There's usually a lot that I want to discuss when I'm finished with any given episode, at least. Quick question though: did it seem to anyone else like nobody was exactly clear who was interviewing whom? The liner notes said that Couric was the guest but it kind of felt like she was just doing a straight up interview. It was still a good episode, but kind of threw me. Anyone else notice? Just me? Yeah, I got the sense that both parties were sort of equally starstruck, and it made the conversation kind of weird. Also, hearing Katie Couric using non-FCC-regulated language on a podcast was like hearing Minnie Mouse cuss. Katie Couric has her own podcast, so I was thinking maybe they were going to use it on both sides? Which would be weird, but that's what it sounded like was happening. Interesting episode, but that dynamic did have me confused. Yeah, my guess was that it's going to be cross-posted on her podcast's feed. They did a similar thing with Chuck Todd a couple months ago. Haha, what? I'd been happily subscribed to Keepin' It 1600 throughout the campaign and was kind of bummed that they vanished of the face of the earth (or at least the face of my podcast app) after Christmas. And now thanks to this post, I find they apparently ditched the show months ago to launch a carbon copy of it under a new name without letting any of their existing subscribers know about it? Seems like a bad growth strategy, guys. Wow, glad I posted this Rhaomi! It is pretty much Keepin' It 1600 exactly. Tommy's own show, Pod Save the World, is pretty good too. Anyway, they talked up the new venture on Twitter; that's how I found out about it. I understand it would be frustrating if you don't use Twitter, but I suspect ESPN wasn't too keen on allowing them to use the Ringer as a platform to promote a new competitor. It's not just a carbon copy, though. Their first episode under the new umbrella was a very thoughtful explanation about how they wanted this show to be different. They seem to regret their pre-Election Day style of sitting back, observing the goings on, and telling worried Democrats not to "wet the bed," an attitude that may well have lulled listeners into inaction. This new podcast is supposed to be more engaged and activist, although this Katie Couric episode, while entertaining and a worthwhile listen, is not a good example of that. I hope that they continue to work on "resisting" more than "humorously observing" because we need people who know the system to tell us how to work and change the system. Pod Save the World is great. One of the things I liked about KI1600 and PSA is the insider view of how things actually work in the WH, and PSW extends that to the national security and diplomatic infrastructure. It's not as entertaining as PSA is, but it's really informative. And yeah, the transition from KI1600 to PSA was abrupt, and I'm sure that was entirely for legal reasons. There was a bit of boilerplate praise for Bill Simmons/The Ringer at the beginning of PSA ep 1, plus some vague language but ultimately no clear reason given for the change. They promoted it a lot on Twitter, but I don't think there was a lot else to be done about it, really. They're building things up pretty quickly--Ana Marie Cox launches a podcast under the network banner on Friday. I like this podcast, but it desperately (desperately) needs to have permanent panelists who are women and PoC (not only to push back on some of the ridiculous things that guests say, but also those that the guys say). Case in point, the discussion with how "controlled" Clinton was. Clinton was "controlled" for a multitude of very good reasons, but listeners are never going to hear an explanation of why this was from a panel consisting entirely of men. There were also announcements on some of the other Ringer podcasts at the time, about the new name. But if you didn't listen to those other podcasts, you would have missed out. > I like this podcast, but it desperately (desperately) needs to have permanent panelists who are women and PoC (not only to push back on some of the ridiculous things that guests say, but also those that the guys say). I listen to exactly one of other "three white guys talking" podcast and I feel like two is really stretching. They used to have a lot of women guests (I really liked the woman who did the 15 minute finance podcast whose name I'm too lazy to Google) who would be great additions to the show. I hope they bring someone on permanently. The way horrible Trump news has been happening so fast, I find it hard to keep up with this show the way I normally do - current events podcasts are tricky with my "wait a bit and binge a few episodes" podcast habits. It's really good but I find myself only interested in the newest episode, back episodes are immediately outdated.